Sudha Ragunathan has been awarded the Sangita Kalanidhi for the year 2013, one of the most prestigious awards in Carnatic music. The occasion called for a celebration of sorts…a celebration not only for the Award, but also a celebration of Sudha’s journey to this destination. 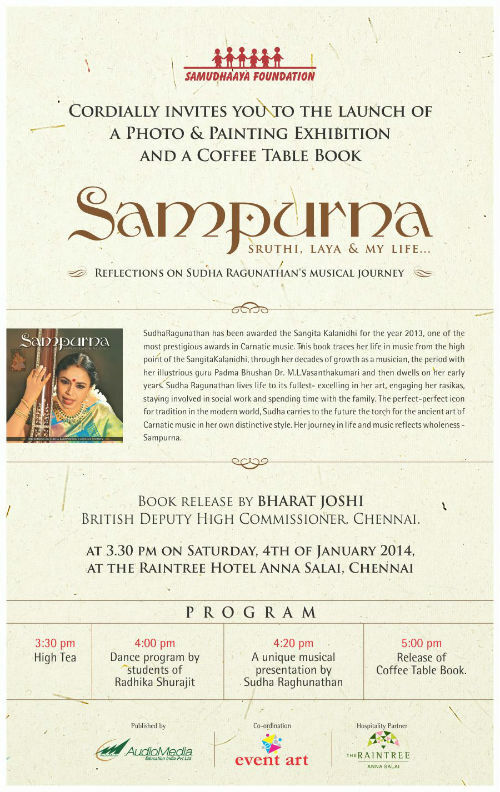 This book traces her life in music from the high point of the Sangita Kalanidhi, through her decades of growth as a musician, the period with her illustrious guru Padma Bhushan Dr. M.L.Vasanthakumari and then dwells on her early years. Sudha Ragunathan lives life to its fullest- excelling in her art, engaging her rasikas, staying involved in social work and spending time with the family. The perfect-perfect icon for tradition in the modern world, Sudha carries to the future the torch for the ancient art of Carnatic music in her own distinctive style. Her journey in life and music reflects wholeness – Sampurna. 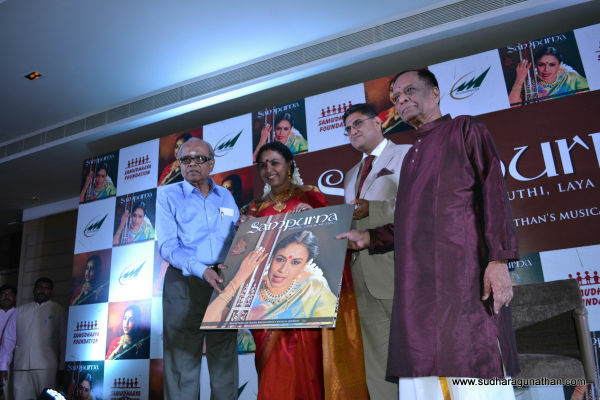 The Coffee Table Book was launched on 4th January, 2014 by Bharat Joshi, British Deputy High Commissioner with copies being received by legendary Director Padma Shri K Balachander and legendary musician Padma Bhushan Dr. M. Balamurali Krishna. The launch was held at Rain Tree, Anna Salai, Chennai.